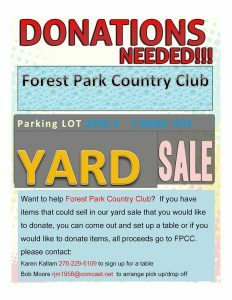 This is a fundraiser for FPCC to be held in the parking lot (inside if it rains). We are asking everyone to participate, set up a table and help sell and/or donate. If you can donate items, but don't have a way to get it to FPCC, let us know and will arrange pickup. Regular monthly meeting held on the 2nd Tuesday of every month.